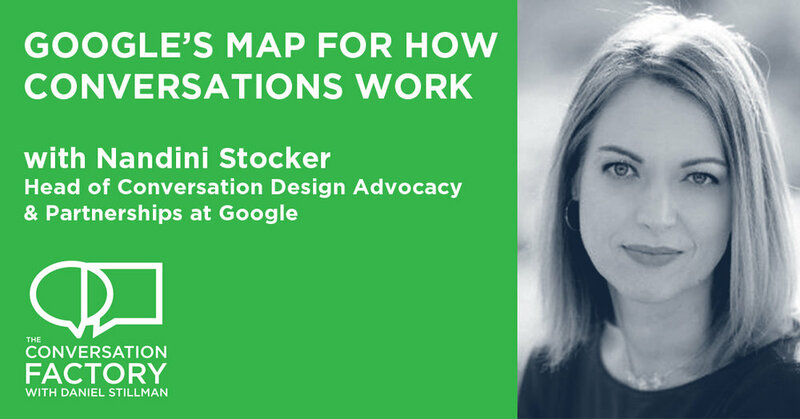 In this episode of the conversation factory I had the distinct pleasure of talking with Nandini Stocker, the head of conversation design advocacy and partnerships at Google. She's the rare individual who is more of a conversation design geek than me, to the point that she interrupted me just to make a point about how awkward interruptions are! We cover a sprawling number of topics in conversation design, and you might enjoy downloading Google's PDF on "How Conversations Work" and read along! I think just knowing that threading, repair and turn taking are *things* means you can look for them in your own work and find ways to transform conversation experiences that you design. David Bohm, the storied physicist, wrote a book called "on dialogue" and said "Conversation is a principled, mutual process of collaboration and negotiation." So I shouldn't be surprised when Google's map of how conversations work matches exactly to the process of opening, exploring and closing I teach groups to follow when designing a creative, collaborative process for design thinking and innovation. Opening a channel for conversation is like the invitation into a cooperative game, a world to explore and engage with, and every leader needs to think empathically to design these invitations to be...inviting! Finding places along a conversation journey where there is breakage leads us to think about how to repair the thread of conversation and keep things moving along towards closure: a desired action or agreement! We've be conversing for thousands of years, and we've gotten pretty good at it. But being good at something doesn't mean you know how to teach someone else how. Nandini's work is specifically on how to help us talk to digital agents with more natural ease. We spoke a few weeks ahead of Google's I/O conference, and she's since sent me a wealth of talks that happened there that you might enjoy digging into. One of my favorites is from James Giangola, who *literally* wrote the book on Voice Interfaces. He talks about Conversational Hacks and digs into the cooperative principle, a way of helping us think about how relevant, clear and helpful information is exchanged at a steady pace in a good conversation. "How much did your shirt cost?" "Don't you love it? I got it at Vinnie's Vintage Warehouse!" "Don't you love it? Shirt has five letters and five is my favorite number!" To a computer, both responses contain about the same "amount" of information, but only a human conversationalist can tell that the information is irrelevant and unhelpful...at least for now! If you want to hear Nandini tell one of the worst/best Harry Potter puns ever (She calls puns the earworms of the English language, check out this short outtake.